Back in the 1990s, your incomes grew by $6,000, and over the last several years, they’ve actually fallen by nearly $1,000. A prominent Democratic Hillary supporter once told me that Obama gives him “post-partisan depression.” Indeed — his apparent unwillingness to take such clear shots is starting to seem bizarre. ... when the average American family saw its income go up $7,500 instead of go down $2,000, like it has under George Bush. First, there is little evidence that the proposed tax increases on high-income households would seriously harm the economy. The effective average tax rates at the top would be about the same as they were in the mid-'90s, which if memory serves were boom years for investment and entrepreneurship, boom years for the U.S. economy, and boom years for federal revenue. Second, even with the Obama tax plan, the distribution of after-tax income would still be roughly where it was only four years ago. Piled Higher and Deeper examines "How Professors Spend Their Time." As I noted recently, the effects of the fiscal stimulus tax rebate should be judged relative to the counter-factual of how consumption and output would have behaved in the policy's absence. This, of course, is unobservable, but Christian Broda and Jonathan Parker have found a clever way around this problem. They exploited the fact that the checks went out in a staggered fashion and compared the behavior of the households that had received checks with those whose hadn't come yet. [T]he average household increased its weekly expenditures on non-durable goods by 3.5% after receipt of the rebate. The impact is highest in the week where the rebate is received (not reported) with weekly spending increasing by almost 6% on average during the first week. We find no impact on spending in the few weeks prior to the receipt of the rebate. Interesting - economic theory would imply that households should change their consumption when they get the news of the stimulus, rather than waiting for the check actually arriving. This suggests that households are either myopic, or that credit constraints are binding. [O]ur estimates imply that the receipt of the tax rebates directly raised nondurable PCE by 2.4% in the second quarter of 2008 and will raise it by 4.1% in the third quarter. Update (8/20): Macroblog (hooray, it's back) weighs in. Alex Brill and Alan Viard of the (right-wing) American Enterprise Institute argue that "Senator Obama's proposed 'tax cuts for the middle class' are actually marginal rate hikes in disguise." Note the word marginal - that is, the share of an additional dollar of income that is paid in taxes. The basic point of their analysis is that when you have tax deductions and credits that are targeted at lower- and middle-income households and therefore "phase out" over different ranges of income, the marginal rates can be high because people are losing some of their deductions and credits as their income rises, on top of the regular tax rate. These are the marginal rates in 2009 for a two-earner couple with two children—a college freshman and a 12-year-old receiving after-school care—under some specific assumptions. 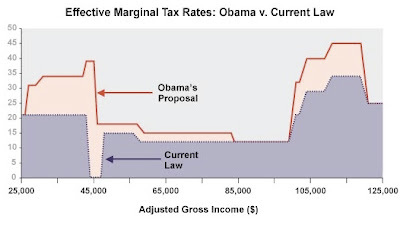 For comparison, the dotted line on the chart illustrates the effective tax rates under current law. The rates shown in the chart are not spelled out in the tax code; they are the result of giving and taking away tax breaks as the household’s income changes. While Obama has publicly embraced a tax rate of 40 percent for couples earning over $350,000, his tax policies would result in a staggering 45 percent effective marginal rate in the $110,000 to $120,000 income range for this family. That is 11 percentage points higher than under current law. The culprit in this case is Obama’s proposed reform of the Hope Scholarship Tax Credit for college tuition, which he would rename the “American Opportunity Tax Credit.” He would increase the credit’s maximum value from $1,800 to $4,000 while still phasing out the credit over the same income range, $100,000 to $120,000. The larger phase-out would boost the penalty on work from 9 percentage points to 20 percentage points. 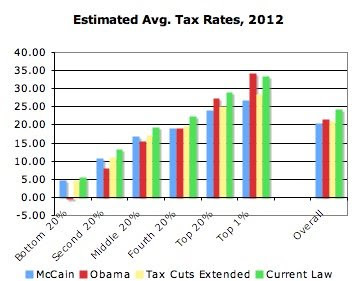 It is important not to lose sight of the fact that, overall, average tax rates - i.e., the share of income paid in taxes - for households in the lower 80% of the income distribution are lower under Obama's proposals than under (i) McCain's proposals, (ii) a scenario where the Bush tax cuts and patch of the alternative minimum tax are extended and (iii) current law, which includes the scheduled expiry of the 2001 and 03 tax cuts in 2010. This chart is based on the Tax Policy Center's analysis: (Specifically, Tables T08-190, T08-201 and T08-0207; for Obama this does not include the possible modification of the cap on social security payroll taxes, which could further increase rates at the top). So, for the vast majority, the tax burden will be lower under Obama's proposal. However, the structure of the plans means that marginal tax rates could be high for some "middle class" households. Is that a problem? Sort of, maybe. It is the marginal tax rate that affects incentives - e.g., the benefit of working overtime or taking a second job would depend how much of the additional income you actually take home. Higher marginal tax rates would be expected to distort people's decisions more. So, if this actually causes people to change their behavior significantly, it is problematic. Most economists would agree on that, in principle, but the magnitudes matter, and much of "conservative" thinking on taxes seems to rely on an exaggerated view of the size of the effect. Matthew Yglesias notes that real problem with Obama's tax proposals may be that they won't bring in enough revenue to meet public needs. Via Economist's view, Brill and Viard's analysis taken apart. Obama economic advisors Furman and Goolsbee explain his plan in a WSJ op-ed. Update (8/17): Via Mankiw, more explanation from Viard. Update #2 (8/17): EconomistMom says: "Alex and Alan are trying to make a big deal out of a small point, and a small point that has hardly any policy relevance." And she has evidence. Saw a headline the other today in an NY paper: "Pavano Solid.'' And I can't think of any bigger waste of space. To learn what Pavano's about, read John Feinstein's interesting book Living on the Black, about Mike Mussina and Tom Glavine. In one story, when Mussina was offered slightly less than $10 million a year in a new contract by the Yankees, he told Cashman, "I can't be paid less than Pavano,'' or words to that effect, and Cashman understood completely. Mussina was then paid $11.5 million a year, or slightly more than the sedentary Pavano. Of course, the marginal product of Mussina's labor is way, way higher than Pavano's (a fixed nominal contract the Yankees surely regret). The Onion explains with an "info-graphic." Data for May and June suggest that the rebate payments provided by the Economic Stimulus Act of 2008 may not yet have provided much of a boost to consumption. The increase in personal saving in May and June approximately matched the size of the rebate checks in those months. Here are the official numbers from the Bureau of Economic Analysis. Personal saving was $45.6 billion in May, compared to $48.1 billion in stimulus payments in May. Personal saving in June was $23.0 billion, compared to $27.9 stimulus payments in June. In stark contrast, personal saving averaged only $2.9 billion per month during the first four months of the year. The personal saving rate tells the same story. After running under 0.5% during the first four months of 2008, it jumped to 4.9% in May and 2.5% in June. The change in the personal saving rate corresponds closely to the size of the rebate as a percentage of disposable income. The figure shows how most of the rebate payments appear to have gone straight into saving. The fact that personal saving jumped by nearly as much as the increase in stimulus payments suggests that most of the rebate checks were saved, at least temporarily, but does not establish it definitively because we cannot be sure what the level of personal consumption expenditures would have been without the rebate checks. If personal consumption expenditures would have collapsed absent the stimulus payments while personal disposable income would have held steady, then the personal saving rate would have spiked up in May and June in any event, and its sharp rise when the rebates arrived does not then indicate that most of the rebate payments were saved. That most of the rebate checks were saved is, though, consistent with the results we find using the University of Michigan Survey of Consumers. When consumers were asked whether their stimulus check would lead them to “mostly spend, mostly save, or mostly pay down debt,” only 18% answered that it would lead them to mostly spend more. For those keeping score: that appears roughly consistent with the permanent income hypothesis, or perhaps Ricardian equivalence, but not the Keynesian consumption function. One caveat: as Shapiro and Slemrod note, we can't assume savings rates would have remained constant. Or, well, economists can assume whatever we want of course, but its not necessarily correct - negative shocks to household wealth (housing market) and expected future income (sluggish economy), if unanticipated, would have led people to save more. So the stimulus "worked" to the extent consumption spending was higher than it otherwise would have been, and to the extent this had a multiplier effect. Therefore, we need a structural model to estimate the counter-factual (i.e., the Lucas critique applies). In any case, as Shapiro and Slemrod note (and some argued at the time), one way to make sure the money is spent is for the government to spend it directly. So, in the cold light of day, what happened with the rebates was that the government issued more debt than it would otherwise have issued, and consumers now hold less debt than they otherwise would have. That looks like a shifting of liabilities from individual balance sheets to the government balance sheet. In other words, it was a bailout of consumer debt. Of course, our government's liabilities are our liabilities, but they carry a lower rate of interest than household debt, so we are saving on interest and since we are net borrowers from the rest of the world, that does represent a net national saving, rather than just a redistribution (its sort of like one of those "loan consolidations" where you combine your bills into "one low monthly payment"). There is a redistributional impact, though, to the extent that the future tax code is progressive, a larger share of debt will be paid by higher-income households. In the Journal a few days ago, Martin Feldstein opined that the policy (which he had supported) was a flop. That generated a number of responses, nicely rounded up and added to by Mark Thoma. Last week's economic data releases, the GDP numbers from the BEA, and unemployment from the BLS, were consistent with an economy growing sluggishly (and thereby skirting an official "recession") but too slowly to keep unemployment from rising. (GDP growth: blue line, left scale; unemployment: red line, right scale). In the second quarter, GDP growth was driven by increases in exports (9% annual rate) and decreases in imports (-6.6%); hooray for the declining dollar! An increase in federal government purchases (6.7%) also gave a boost. New housing construction (a.k.a. "residential fixed investment," -15.6%) continued to plummet, and, while overall consumption was up, durable goods expenditures fell at a 3% annual rate (as reflected by the car industry's woes). As James Hamilton noted at Econbrowser, one silver lining in the report was a negative contribution from "inventory investment," which suggests firms have less stuff laying around and will need to produce more in the future. The GDP release included the "annual revisions": now the BEA estimates that growth was indeed negative during the fourth quarter of last year (-0.2% vs. previously estimated 0.6% annual rate; this is not evident on the graph above since it plots % change from 1 year ago) and overall growth for 2007 is now pegged at 2.0% (previous estimate: 2.2%). Marginally attached workers are persons who currently are neither working nor looking for work but indicate that they want and are available for a job and have looked for work sometime in the recent past. Discouraged workers, a subset of the marginally attached, have given a job-market related reason for not currently looking for a job. Persons employed part time for economic reasons are those who want and are available for full-time work but have had to settle for a part-time schedule. Based on this measure (above), which rose to 10.3% in July, DeLong calls a "recession." and represent it with nifty graphics. These graphs of the costs of US wars were created by ProPublica (hat tip: M. Yglesias). That is, because of economic growth, the US is a much richer country which can afford (financially, at least...) more of everything, including war.